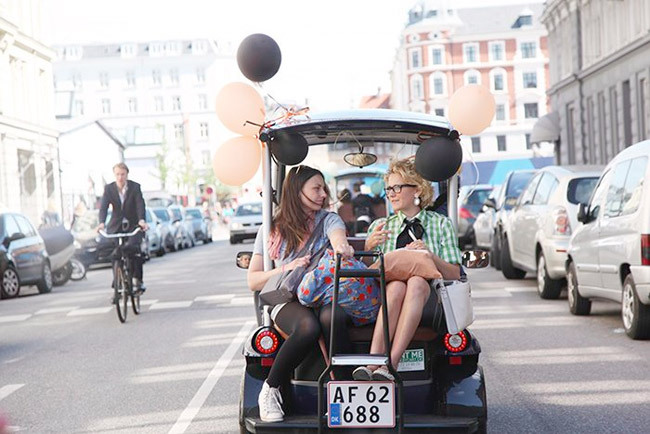 A week ago we went to Copenhagen for a day of Blognhagen. A whole day full – hanging with other bloggers experiencing some of the cool things Copenhagen has to offer. We had so much fun! The idea came from these lovely ladies. “Californian born creative brain that now lives in Copenhagen Brittany from the blog The house that Lars Built and event/PR consultant/ mega/cool girl Maria who is from Copenhagen. The idea is simply to show a city from their perspective for bloggers from other countries. Just to be clear we are not paid to write this, but to be able to drive around and make this day happen there where sponsors involved behind it all and those we are talking about in this post. But not without liking them ourselfs. We started the day by picking up these little cool golf cars that you can rent for a day and we passed by the little mermaid. She is cute – but I think a postcard would have done it. The golf cars where a great way to see town. I got to drive it – wich I love – driving weird stuff I mean. Ashley from the blog Chasing heartbeats and I sporting the same Iphone cases outside the Mayers Bakerier from where we got our breakfast. Appaerntly he is one of the guys who’s behind the Noma restaurant which is considered one of the top restaurants in the world. The cinamon buns was off the hook. We had the breakfast at Marias house – decorated with Brittany’s paper flowers and Royal Copenhagen china – the same kind of plates which we where going to paint our own, later during the day. I love seeing how people live in other cities.Denmark is not far from Sweden but it’s kind of another world. In Sweden it’s clean and new. Here it’s more forgiving and much more patina over all the houses and ideas. I also have the Utensilo at home – the best thing to have in a hallway. Jenny will give you a greater tour of Marias place laters. The next stop was at fashion house Baum Und Pferdgarten, I always liked their style and picked up this dress (but in grass green) in their sales! Love the sales. Everywhere we went that day – Agnes Cupcakes where following us around. Painting China at Royal Copenhagen was fun. I didn’t know if I should follow the lines or paint my own stuff. Kind of wish I got more crazy with it. Jenny also did a What’s in your bag – special with all the bloggers that joined Blognhagen. Here she is working with Anne from the blog Pret à Voyager. After all this crazyness it was time for lunch. At The Royal Café. Both me and Jenny fell in love. With the owner, the decoration, all the small things you can buy. And the food! Smushi is a kind of sushi gone wild danish smørrebrød. Very tasty and a great idea. Go to this place when you are in Copenhagen! This was only the first part of the day.We’ll be back with more! Oh man! I love the LIttle Mermaid shot! And I love seeing all the things you saw while you were behind the camera. Nice ones!